You already know I’m a diehard spreadsheet fan. Especially when it comes to tracking all things money. And, I’m certainly not alone in my level of spreadsheet geekiness. Spreadsheets are the tool of choice for many, many financially successful people around the world (and the world wide web…!). Most of the people that ESI Money interviews on his weekly Millionaire Interview Series track their money using Excel. J.Money shares his budgeting and net worth spreadsheet (both the template to share and his own personal monthly net worth update and he’s nearly at a million too!). And most personal finance bloggers out there use their own customized spreadsheets to track everything from their monthly spending to their current progress to retirement. I have to insist that Excel is the best money tool there is. Period. I hinted to my email subscribers a while back that I have an Excel project in the works that will help you track your entire money life and I’ve got a little preview at the end of this post plus a little surprise for subscribers. So stay tuned. Once in a while, I stumble upon the most beautifully designed budget printables. They have the perfect fonts and color schemes and just simply look like maybe (just maybe!) they’ll make the whole process easier and better. Because sometimes you just need pretty things to make tedious ones seem not so hard, right?! The only problem with using budgeting printables is this: nearly no one sticks with the pen and paper method. Writing things out by hand takes way more time than typing. A paper won’t automatically add up your numbers for you. Papers get lost. You can’t quickly update numbers, headings or copy and paste data to compare and analyze it. It’s simply way more work for way less functionality. You know what, though? If you wanted a hard copy of your spreadsheet, all you’d have to do is print it out. Bam. Spreadsheets win. There are some incredibly useful online calculators out there. I have quite a few links to online calculators throughout my blog posts. Some of the most useful ones are for investment, college and retirement planning. The biggest problem with online calculators, though, is that you have to re-input your numbers each time your information changes since it’s not possible to save them for later. And things are constantly changing. Of course, you also can’t customize the calculator to match your exact needs. These calculators are great for quickly getting an idea about how much college is expected to cost in the future or quickly running a compound interest calculation. However, financial planning is an ongoing task, not a one-time number crunching exercise. It’s certainly a lot more work to customize your own spreadsheet, but in the end, it will actually save you time! You may be thinking…”hey, but I thought you use and recommend a few personal finance software programs? !” and you’d be right. But, if I had to choose between the personal finance programs I currently use and Excel software, I would definitely choose Excel without hesitating. Why? Because I can build and customize everything I need directly in a spreadsheet. I do, of course, use some personal finance software as well. For budgeting, I think YNAB is the best thing out there (fun fact: did you know that it originally started out as an Excel spreadsheet?… I’m sure that has something to do with why I love it so much!). My own personal method is to budget my money with YNAB (I love knowing that I have a plan for each and every dollar) and then transfer the aggregated monthly income and spending information over to my annual cash flow statement in my spreadsheet. For portions of investment tracking, I use Personal Capital. It does a great job of analyzing mutual fund and account fees, asset allocations and I also love the graphs and charts. It also constantly pulls in all of my real-time financial data so I can get a quick snapshot of my finances at any point in time (which is also a bad thing sometimes when I check a little too often!). For projecting my investments and tracking the nitty gritty details, I’m back to my spreadsheet. So while I don’t have anything against personal finance software, I think it’s a necessity to have a spreadsheet that fills in some of the gaps. For the past couple of years, I’ve been working to create an Excel workbook that integrates many of my spreadsheets together to make my planning progress as streamlined as possible. I’ve used it for myself, improved it, changed it up dozens of times and finally have something to share with you all. 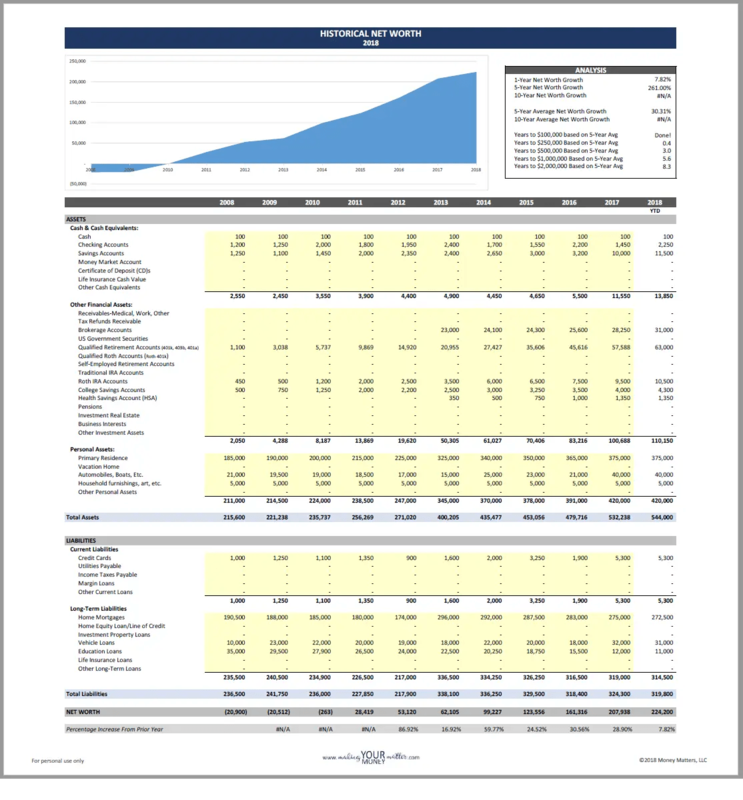 It isn’t your typical budget spreadsheet. In fact, budgeting is not the main focus of this workbook at all. I strongly advocate for using automation for managing your budget (if you even want/need one) and tracking your expenses. YNAB or dozens of other budgeting apps make it easy to quickly import and categorize your transactions. 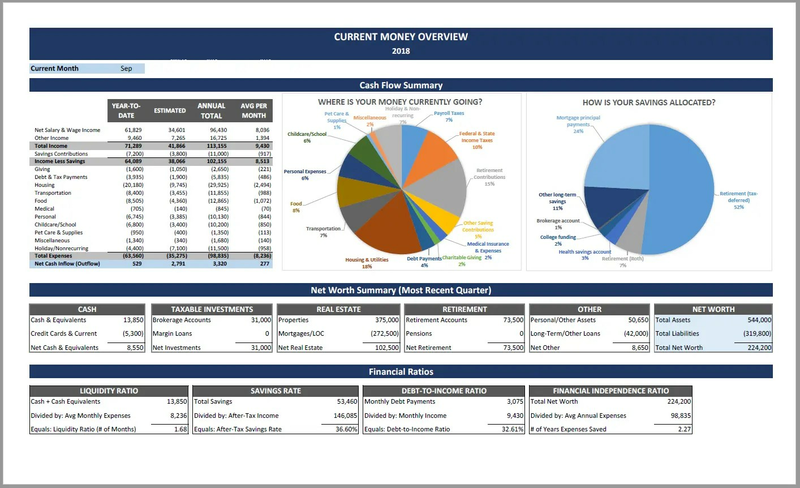 Instead, this spreadsheet emphases cash flow tracking as a means to help you streamline so many other things in your financial plan (such as your taxes and retirement planning). Actually, tracking your expenses is THE number one thing I recommend to take your personal finances to the next level, no matter where you’re currently at financially. A budget is not a requirement! As a quick side note, Tiller, a great Fintech company that you can use to automatically pull your bank transactions into a spreadsheet, just recently started rolling out their Excel integration (it was previously only in Google Sheets). I think it’s the absolute best option if you don’t live by a set budget each month, but you still want to automate tracking your expenses and you love spreadsheets. I’m not currently an affiliate with Tiller, I just think they have an amazing product! I’m going to share my Basic Financial Essentials workbook (for free) with my email subscribers through the end of October. You can join my email list here so that you’ll receive it when my October newsletter goes out. 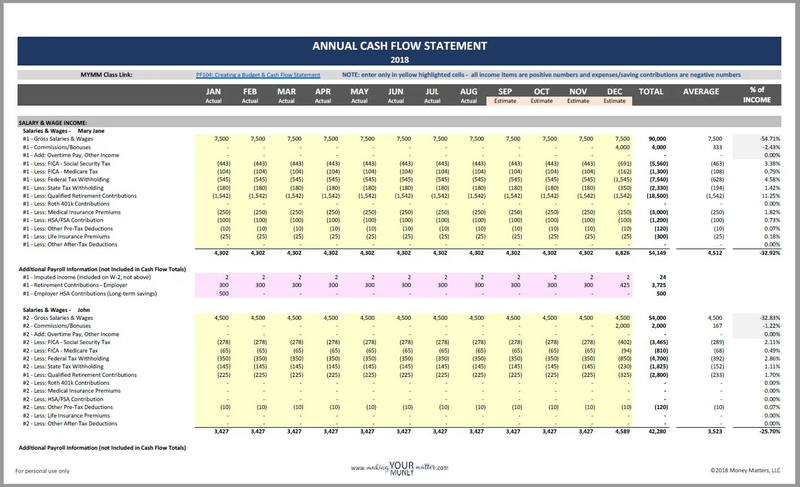 The core of the workbook is the “Annual Cash Flow” sheet, which allows you to move from estimated to actual income and expenses throughout the year. This sheet is where you’ll list all of your income and spending for each month. This spreadsheet also tracks and analyzes your current and historical net worth. This is another one of the best financial metrics to see how you’re improving financially. This first Excel workbook is just a small part of an overall financial plan, but it includes the basics for so many other parts of your plan. just simply gives you the feedback you need to improve your savings and spending habits. And last, here’s a sneak peek of some of the other workbooks in progress as well as a more detailed overview of the basic financial essentials portion. I’m most excited about the tax planning spreadsheet, which has been an immense amount of work with the new tax laws and updating for the new regulations and draft forms, which have been coming out in the past few months. It not only links to the cash flow sheet to pull in taxable wages, interest and, dividend income but even links to my mortgage amortization schedule to pull in this year’s deductible interest, which makes me so happy. And who doesn’t love to check out their progress toward retirement from time to time (like when you’re having a bad day at work perhaps!)? This makes it so easy. And with 3 kids in the house, I have to keep those college funding calculators running. The TL;DR summary: use a spreadsheet to track your money. If you can create your own that is customized to your needs, do it. It’s totally worth the time! If you don’t want to start your own from scratch, find one that has many of the features you’re looking for and further customize it to your needs. Check back here, as I’ll be rolling mine out throughout the end of the year! Do you use Excel to track your personal finances or something else? I’d also love to hear any suggestions and feedback if you try out the Basic Finance Essentials workbook! You had me at “spreadsheets”! Especially spreadsheets that someone else builds. Thank you! Awesome post – can’t wait to receive the newsletter to check it out! Holy cow – you are a spreadsheet ninja for sure! Those look beautiful. That’s incredible – I wish I was that good with those. I can usually get the functional part going, but they definitely don’t look pretty! Thanks for the kind words Jim! Looking forward to the spreadsheet, nice work thus far. I add in data from the Social Security Administration (SSA), SS wages, lifetime index wages, annual benefit (self and spouse), the two AIME inflection points, max benefit year, max benefit year with spouse. This is a great idea. It would make it easy for people to run their social security estimates based on retiring early, etc. and also help people understand how social security works (which I think most people don’t know). Thanks for the suggestion! I am subscribed to your YouTube channel and ran across your spreadsheet there. Very impressive! I look forward to giving it a try. Thanks for stopping by and do let me know what you think of the spreadsheet once you try it out! GREAT SPREADSHEET! From one spreadsheet geek to another, well done! I’ll shoot ya an email back to the email subscriber email address, but I gotta say this is a great asset and for those like me who were already trying to integrate YNAB and excel to cooperate for tracking purposes, (cashflow, net worth, spending habits, and many many many more metrics). Yours incorportates a ton of great metrics and appears to be very user friendly! EVERYONE should subscribe to this! Best wishes, keep up the great work! Thanks so much for the kind words! I’d love your input when you try it out and suggestions on what else you might find helpful! I love your spreadsheet video. I wish I had 1% of your spreadsheet skill. I might up my net worth calc frequency to once per quarter. I have been calculating my NW once a year for the past 4 years. Thanks for the kind words! I’ve found quarterly net worth tracking is a good balance. I used to do monthly, but it really wasn’t useful and took more time than needed. That’s great that you have a few years of tracking already-it’s fun to look back and celebrate your accomplishment rather than solely pushing forward to the next milestone. That’s a pretty badass spreadsheet, but I love my YNAB! It’s not meant to replace a budget software, but to provide additional analysis (like the forward-looking planning that YNAB doesn’t cover). I still use (AND LOVE) YNAB too!